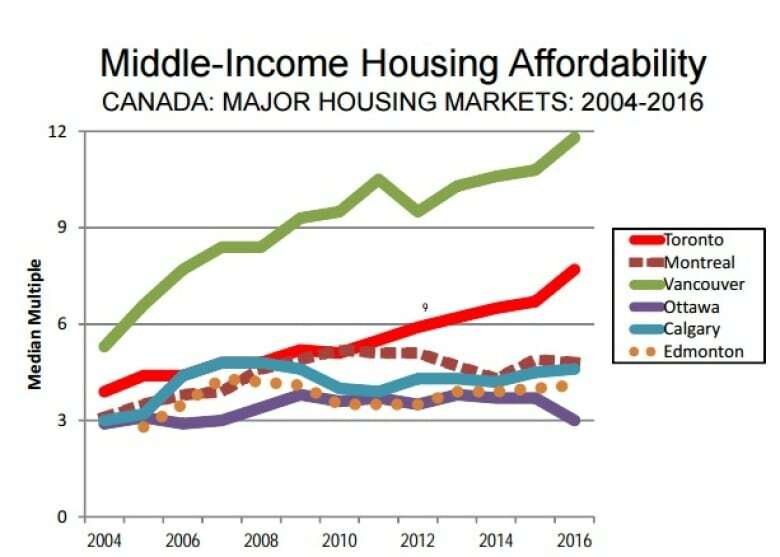 Vancouver has experienced the greatest housing affordability deterioration among major markets in the Demographia Annual International Housing Affordability Survey since it began issuing yearly reports in 2004. For yet another year, Vancouver has the dubious honour of being one of the most unaffordable cities for housing, according to an annual international study. Vancouver ranks 3rd in the 2017 Demographia International Housing Affordability Survey, down one spot from 2016 when it was second. The survey compares 406 metropolitan housing markets in nine countries: Australia, Canada, China, Ireland, Japan, New Zealand, Singapore, the United Kingdom and the United States. It's the 13th edition of the report, which links median house prices to median household incomes otherwise known as the "median multiple." A value 3.0 or under is deemed affordable. Vancouver's median multiple is 11.8. "As in all of the previous Surveys, Vancouver is rated as having the worst housing affordability in Canada," read the survey. "Vancouver is rated severely unaffordable." Even more troubling, according to the survey, is that since 2004 Vancouver "has experienced the greatest housing affordability deterioration among major markets." During that time, the city's median multiple more than doubled from 5.4 to 11.8. This year's study notes Vancouver has also experienced modest net domestic out-migration, meaning more people moved out of the city than moved in. Toronto follows behind Vancouver as having the second least affordable housing in a major market in Canada. Its multiple median score is 7.7, while Canada's most affordable major market is Ottawa-Gatineau with a score of 3.9. The least affordable smaller housing markets in British Columbia are Victoria (8.1), the Fraser Valley (7.1), and Kelowna (6.4). The study calls for governments to take action to address housing prices and places significant blame of deteriorating conditions on urban containment policies, which limit urban expansion. "We should not accept extreme price levels in our housing markets," wrote Dr. Oliver Hatwich in the forward of this year's report. He is with the New Zealand Initiative, a think-tank focused on housing affordability. "High house prices are not a sign of city's success but a sign of failure to deliver the housing that its citizens need."